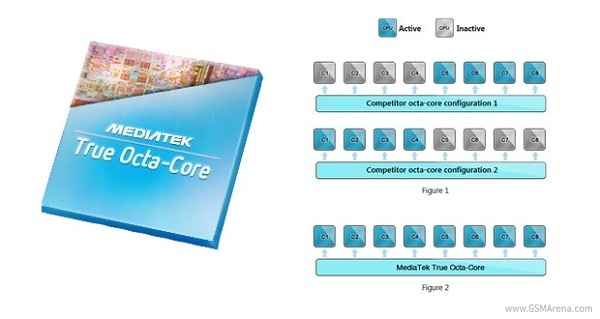 Mediatek has finally and officially launched the MT 6592 chipset, which is company’s first TRUE octa / 8 core chip for tablets and smartphones. The company claims that the MT5692 is world’s first true octa-core mobile chip, which has ability to utilize all eight cores on the same time. It has Heterogeneous Multi Processing in CPU (HMP) and each core can be clocked up to 2GHz frequency. The mass production of MT6592 chip has been already started. We can expect MTK6592 powered smartphone and tablets before the 2014 with Android 4.3 / 4.2 Jelly bean on board. Intex has recently announced that they will launch India’s first MTK6592 powered smartphone.